Be our guest in the best location around. This this the ultimate Old Town location for skiing, shopping, and entertainment, right in the center of all the action on Main Street in historic Old Town, Enjoy our Penthouse unit with Private Balcony mountain views. Only steps to everything, this ultra stylish studio condo sleeps 4 with two queen size beds. You are just up the street from the Town Lift and the Ski-In Bridge allowing you to ski practically back to your door. Surrounded by top-rated restaurants and shops with ski-rental downstairs in the Galleria Mall. No need to rent a car and hassle with parking, as you are across the street from the city terminal offering FREE buses to Deer Valley and The Canyons. Transportation to and from the airport, and ski rental can be coordinated with booking. 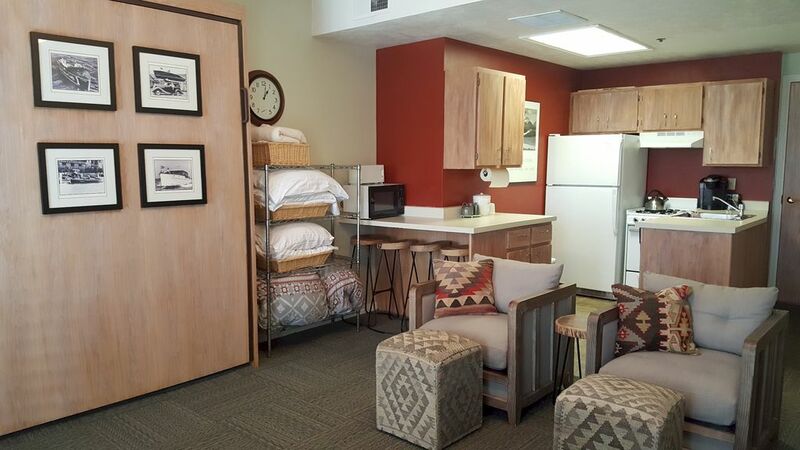 The unit is outfitted with all amenities, including full kitchen and bath and a ¼. Watch movies on your 32 inch flat screen TV with Theater Surround Sound, and stay connected with Wi-Fi Wireless Internet Access and Netflix smart internet TV. Snuggle into your Down Feather bed with Down Pillows & Comforters. Pure Egyptian Egyptian Cotton Sheets and Towels. Hot tub and laundry facilities available as well. This highly desired location books fast! We are ParkCitySkiBums! Avid Skiiers and travellers. We enjoy every moment possible! Enjoy our Private Penthouse Balcony Overlooking Main Street with a restored authentic 1960's Park City Ski Lift Chair! as you watch the sunset over the mountain apres ski! Cappuccino Maker, Coffee Maker, Tea & Hot Chocolate! This Penthouse unit has a Private Balcony overlooking Main Street in Old Town. It is outfitted with an originial restored 1960's Park City ski Chairlift for your apres ski enjoyment! THe Town Lift is visible from our Penthouse Private Balcony and easily walkable in your ski gear! You can't get a better location! Always Direct check-in at the unit! This unit has always been owner managed for over 16 years! We have been on VRBO for over 16 Years as well! Come be our guest at the ParkCitySkiBums Condo! Terrific location for a ski weekend in park city. Looking forward to staying again next year! Clean and convenient. Awesome location. A short walk to the town lift made for a great location for skiing. The shops and restaurants were all around us for easy access. The owners are very attentive and respond almost instantly to any questions or concerns. The kitchen was well stocked for cooking in condo meals which cut meal costs (my husband took the free town bus to the grocery store 5 min away). The Murphy bed was comfy and the kids seemed to sleep well on the futon. We did have to open the slider at night to cool the condo a bit but no one seemed to mind the noises from the night life below. All in all we would definitely book ski bums condo again. We loved this location! Close to shuttle, ski lifts, rentals and restaurants. The views from the balcony were beautiful! Owners are very very responsive and helpful. I wouldn’t hestitate for a second to stay here again. Fantastic location, clean and comfortable! What a great condo! The location is amazing - so convenient to Park City Town Lift and all of the great restaurants/shops of Main Street. Our family of four was cozy, and the condo was super clean and stocked (tons of towels, a nice kitchen, large bathroom). Thanks so much, we loved having your family stay in our condo!